The Under Armour Curry 3 sticks on the hardwood like the HOVR Havoc. Most players are reporting that these UA shoes have excellent traction on clean and semi-dusty courts. A good number of users note that these Steph Curry shoes have amazing step-in comfort. Many buyers love the silhouette and colorways of the Curry 3. They said that these UA basketball shoes look good and can be used daily. A lot of wearers appreciate the fact that the Meta-wing carbon fiber shanks provide excellent support. This feature is also present in Klay Thompson's Anta KT 4. Most casual wearers just love how comfortable these Curry sneakers feel. They're able to wear the shoes most of the day. The Charged cushioning provides excellent court feel and increases reaction time, most testers observed. Several users commend Under Armour for the quality of the materials used in the Curry 3. The shoes are priced well, according to a handful of buyers. Some wearers say that these Curry basketball shoes fit perfectly. Many reviewers remark that the shoes are breathable and lightweight. The Under Armour Curry 3 runs long and wide, a great number reported. The shoes lose its traction on dusty courts, a few observed. Frequent wiping is recommended. Several report that their feet started to hurt and have blisters after playing in the Curry 3 for an extended period. A handful of buyers complain that the shoes started showing signs of wear after a few weeks of use. These Stephen Curry basketball shoes lack impact protection according to a good number of players. The Under Armour Curry 3 gives you a responsive court feel, consistent traction, and lightweight support. It performs well on court and is best suited for speedy guards. If you play like Steph, then the Curry 3 is perfect for you. However, if you are an explosive type of player or someone who needs more impact protection, then there are much better options for you at this price point. Much like the Curry 1 and 2, the Curry 3 is a great shoe on-court. Basically, if you play like Steph, the Curry 3 is perfect. I think that the Curry 3 is really solid shoe and slightly better than previous models. What’s good with Under Armour’s Curry line is its consistency. Overall performance has been consistent since the first version came out. The Curry 3, however, was built for what comes next. The latest signature shoe from two-time NBA MVP Stephen Curry provides infinite support and total control on the court. The Curry 3 features Under Armour’s new Threadborne technology for support, Meta-Wings for stability, Anafoam for body-mapped fit, and Charged cushioning for first-step speed. Cushion. Under Armour’s unique Charged cushioning foam absorbs a forceful impact and turns it into a responsive burst of energy. The Charged cushioning of the Curry 3 provides responsiveness that enhances first-step speed and quick direction changes. Meta-Wing carbon fiber shanks line the heel to expressly support the ankle and heel bones for better balancing, pivoting, and shock absorption. Traction. The durable solid rubber outsole of the Curry 3 is covered with multi-directional herringbone. This traction pattern amplifies stability, grip, and support on the court. The outsole also features a pivot circle located below the ball of the foot. Length and Width. 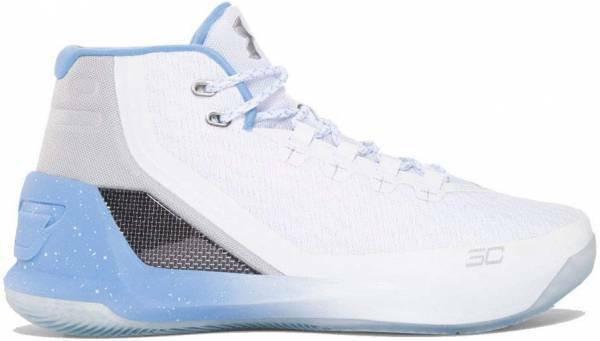 The Under Armour Curry 3 fits true to size; however, reviewers still recommend going to the nearest local shop to try out the shoes first before purchasing. Lockdown. The asymmetrical lacing system pulls the medial side, while the dynamic system on the lateral side locks the midfoot in place. The Meta-Wing carbon fiber shanks provide locked-in stability through the heel, arch, and forefoot. Soft Anafoam molds to the shape of the foot to provide a perfect fit. The Under Armour Curry 3 features a new Threadborne upper that delivers lightweight directional strength. It’s inspired by the fiber materials found in parachutes, known as paracord. Threadborne uses high tension threads to provide the perfect combination of support and breathability. Under Armour also brings back Anafoam to deliver body-mapped fit, lightweight structure, and added support. The Under Armour Curry 3 is designed for infinite support and stability. Additional foam is placed around the ankle collar, and a large heel counter wraps the back of the shoe. Also, the mid-cut design of the Curry 3 does not restrict movement and is ankle brace friendly. The shoe’s large heel counter displays the SC/30 logo and Steph’s signature is found on the Meta-Wing at the medial side. These details complete the shoe’s form-fitting silhouette. Under Armour changed their approach with the conceptualization of the Curry 3. The design team was more interested in involving Steph in the early stages of the project. They asked Steph to look at some sketches and have him circle what he likes, and cross out what he didn’t like. The Curry approved design was a concept that was inspired by fighter jets. Under Armour launched a variety of colorways to boost the sales of Stephen Curry’s third signature sneaker. The Under Armour Curry 3 ‘Brass Band’ features a black base with copper accents. A gradient midsole completes the silhouette. The Chinese New Year colorway of the UA Curry 3 is Inspired by good fortune, happiness, and longevity. These Stephen Curry basketball shoes feature a rocket red upper with multi-colored graphics on the heel counter and midsole. A metallic gold UA logo completes the festive theme. Under Armour pays tribute to Stephen’s alma mater with the release of the UA Curry 3 ‘Davidson’ PE. This PE colorway is dressed in a vibrant red upper contrasted by a gray midsole. The UA Curry 3 ‘Grey Matter’ is inspired by Stephen’s high basketball IQ. These basketball shoes are dressed in a combination of aluminum, steel, and black. Gray tones throughout the shoe complete the silhouette. The Under Armour Curry 3 takes on a spooky theme. The ‘Lights Out’ colorway features a black upper with hits of orange on the laces and ankle collar. Glow-in-the-dark outsoles and a graphic midsole complete the Holloween-inspired look. This Christmas colorway is inspired by the story of the Three Kings. Dressed in royal colors, these Stephen Curry basketball sneakers feature burgundy and gold. A white midsole and semi-translucent outsole complete the silhouette. On December 2, 2016, a warehouse known as Ghost Ship caught fire and claimed the lives of 36 people. To show his support, Stephen Curry wore a custom pair of Curry 3s that feature “Oakland Strong” on the upper with the victim’s names written on the midsole. These custom Curry basketball sneakers were auctioned off to raise funds and assist the families of the victims. During the 2017 NCAA tournament, the University of South Carolina men’s basketball team advanced to the Final Four for the first time in school history. At the same time, the South Carolina Gamecocks also became the first UA-sponsored team to reach that far in the tournament. To celebrate, Under Armour crafted an exclusive Curry 3 Lux model that features an Oxblood leather upper, a quilted heel panel, waxed laces, and a Sail outsole. The Under Armour Curry 3 ‘Panthers’ colorway is a nod to Stephen’s favorite football team, the Carolina Panthers. This Panthers-inspired basketball sneaker features a teal upper and a black midsole. Stephen Curry will go down as one of the best shooters in NBA history. Inspired by his wet jumper, the Under Armour Curry 3 ‘Reign Water’ features a Neptune green upper for an aquatic tone. “I like the element of water being associated with my game. Free-flowing, can't be contained. Just play free, have joy and let everything take care of itself. When someone says ‘your jumper's wet’… well, water's wet right?! ?” Stephen explained.